Japanese people love kitsch. Whether it’s frilly maids in Akihabara, grown women spending all of their holidays at Tokyo Disneyland, Pokemon or Hello Kitty painted fifteen feet high on the body of an airliner, … nothing can be too “kawaii” or cute. Such concept just does not exist. A new form of kawaii has developed in recent years in the shape of “Yuru Kyara”, literally “loose characters”. Yuru Kyara are mascot characters who promote businesses, local areas, or regional produce. Their “looseness” lies in the quirkiness that comes from the things they are trying to promote, which can be anything from towns to leeks to towels, and in their naivety and amateurishness compared to professional creations like Mickey Mouse and Miffy. The boom in mascot characters has been led by regional communities whose Yura Kyara often incorporate the area’s special product, culture, or history. The only rule is that the cuter, the better! Such mascots try to build a brand that a town can market through souvenirs like stationery, toys, and boxes of cookies. Life-size mascots also make appearances at events and festivals. Some of the more famous characters have become household names, rivaling Japanese television and sport stars in popularity. There are an estimated 1,000 mascots throughout Japan and a competition called the “Yuru Kyara Grand Prix” is held annually to select the most popular. King of the Yuru Kyara is Kumamon, a black bear with a stunned smile who represents the Kyushu town of Kumamoto. Despite being a cartoon, Kumamon is active on social media and has nearly 300,000 followers on Twitter. He has also made overseas trips promoting tourism to Japan. Not to be out-done, here in the Hakuba Valley the villages of Hakuba and Otari have taken the plunge and created their own characters, Victoire Cheval Blanc Murao 3rd and Tari Tari. Please take a look and make the big decision, which one is the most “kawaii” ? Hakuba’s character, Victoire Cheval Blanc Murao 3rd, was born in September 2012. He was designed in a competition by a local eight-year-old and is a white horse reflecting the well-known Chinese characters in Hakuba’s name. His name was the winner in a further competition. The first part is “Victory White Horse” in French, “Murao” is a Japanese name that means “village boy”, and the “3rd” is, well we don’t really know! Maybe it’s a takeoff from the popular Japanese anime “Lupin the 3rd”. Though suitably cosmopolitan, his full name is a bit of a mouthful, so locals have taken to calling him simply “Murao”. Murao featured as part of Hakuba’s 100th anniversary as a ski town last year. He’s a proficient skier, but has also started snowboarding. He once sat in an onsen for over two hours. He realized he was scared of heights when he visited the observation deck of the Hakuba Jump Stadium. One day, he is looking forward to becoming Hakuba mayor. Otari’s character, Tari Tari, or more affectionately “Tari Tari Kun” is a woodpecker. He was also designed by a local boy and named by a local girl. Woodpeckers are found, or should we say heard, throughout the Hakuba Valley. Tari Tari Kun changes his color with the seasons. In spring, he is pink to match the cherry blossoms. In summer, known here as the “green season”, he becomes light green. Like the leaves, he changes to orange in autumn, and then becomes blue in winter. I don’t think we would be able to see him if he were white. In winter, Tari Tari Kun sports a pair of goggles and is a great snowboarder. 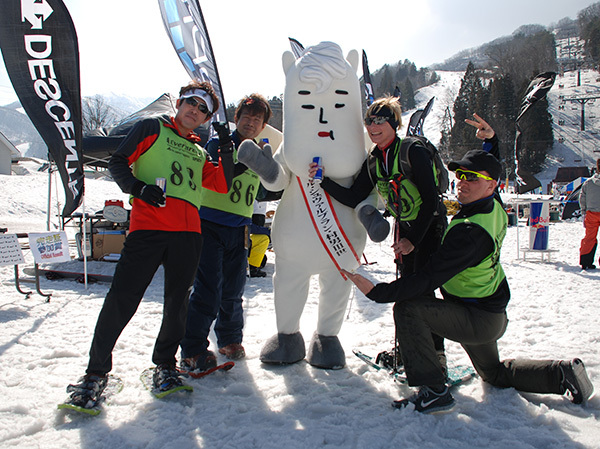 He can ski too, and last year ski-jumped through a ring of fire at the Tsugaike Fire Festival. After a hard day on the mountain, Tari Tari Kun likes nothing better than to relax in an onsen and then enjoy a drink of his favorite Japanese sake. Being a woodpecker, Tari Tari Kun also enjoys tweeting (in Japanese) on Twitter at @taritariotari. Keep your eyes open and you may see Murao and Tari Tari Kun on the slopes or out and about in town. View the latest dining guide of Hakuba Connect. 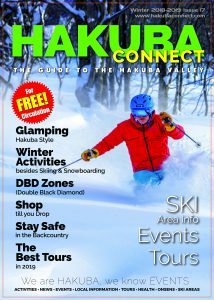 Alternatively you can pick up a copy in most hotels, cafes and restaurants in the Hakuba Valley. Located in the spectacular Northern Alps of Japan, incorporating the villages of Hakuba & Otari, the Hakuba Valley is just three and a half hours north of Tokyo. It is Japan’s favorite year-round destination. There’s majestic mountains with a vibrant base Village, epic skiing and snowboarding, restaurants and bars, accommodation to suit every budget, MTB trails, hot springs and arguably the best mountain hiking anywhere.